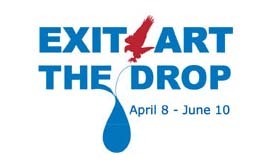 THE DROP public programs will include two panel discussions and an artist-led walking tour of New York's waterways & water resources, organized by Amy Lipton of ecoartspace, a curator who has been engaged with art and the environment for ten years. In the spirit of promoting discussion and analysis, Exit Art has organized a flexible presentation of panels and speakers. The full-day panel and walking tour will focus on visionary approaches to resolving problems with and disputes over New York waterways, and will include artists, activists, water scientists, and representatives from the Department of Environmental Conservation who will speak about the importance of New York waterways. Panelists will present their visionary solutions to the water challenges facing New York City. The afternoon session will be a forum moderated by Amy Lipton, where the panelists will discuss solutions to our local water issues. Each of the participating artists, environmentalists, scientists and landscape architects on the panel will give a five-minute presentation on their work and how it relates to water issues in New York City. The morning panelists will begin a dialogue about real solutions to the water problems facing New York, and then open this discussion with the audience. Artist led walking tour of New York City waterways, exploring existing and former water sources and their importance.